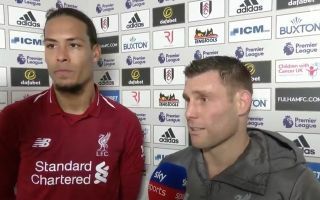 James Milner seemed as a cool as a cucumber in his post-match interview following Liverpool’s 2-1 win against Fulham. The midfielder’s 20 minute was action-packed to say the least. Milner was brought on for Adam Lallana in the 72nd minute of the clash and was tasked with calming the game down by Reds boss Jurgen Klopp, but less than two minutes after entering the field Milner made a horrific error. The retired England international sliced the ball up into the air and his mishit led to a horrible mixup between Virgil van Dijk and goalkeeper Alisson, this allowed former Reds attacker Ryan Babel to score. It looked as though this series of errors would prove costly but Milner had a glorious chance to make amends when Liverpool were awarded a penalty just six minutes after Babel’s goal. Milner remained cool, calm and collected by firing his penalty down the middle of the goal, securing a win for Liverpool. Milner admitted that he was at fault for Babel’s goal and he seemed in quite the jovial mood, considering his lucky escape. Both Van Dijk and Milner showed the level of togetherness that the Reds are playing with, neither made any excuses and you can see that their main focus is coming away with a win from every single game. Liverpool are now top of the Premier League and the pressure is on Manchester City to deliver in their game in hand, which is against their fierce rivals Manchester United at the end of the month. There are still triumphs and tumbles to be had for both sides in the final stages of the title race.